Posted on 11 October 2012. I was inspired to curate the Bedford leg of a travelling Mail Art exhibition after talking with Kayte Judge who had relayed her excitement on seeing and reading about the exhibition online. Within a couple of weeks a cardboard box containing my bursary application in a suitable Mail-Art format was delivered to We Are Bedford . The original travelling Mail-Art Exhibition was the brainchild of Marie-Louise Plum and had started its journey around the UK from London before arriving in Cardiff and continuing on to us in Bedford before arriving in Lincoln, the next stop on its journey. I then received a consignment of the 300 postcards that comprised a recent exhibition depicting the ‘Best of Britain’, created by artists from all corners of the globe and curated by Lavinia Drake to add to the Bedford exhibition. Along with this came some work by award winning Illustrator Gary Hunt. Gary’s contribution included a set of stamps that he had illustrated with cartoon heads, which I used to encourage visitors to doodle on, adding bodies to each of the heads. Some of my own work that uses postage stamps in a mosaic style was also included in the pop-up gallery because of its association with mail and postage. 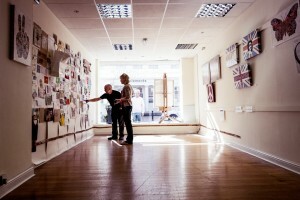 I was ecstatic at being awarded a bursary and as soon as an empty shop became available I immediately put out an open art call for people from all walks of life to get creative and create their very own unique, piece of mail art and post it directly to the pop up shop. I was thrilled and excited to see the wonderful and imaginative work that had been fed through the letterbox each morning and couldn’t wait to be surprised by each batch that followed through the month of September leading up to the launch of the exhibition on the 22nd. I was amazed at the amount of people who wanted to be involved and created pieces that went on show, including those from local school children, artists, well-being groups and strangers wanting to be a part of a community project celebrating the joy of art on a simple envelope. On the morning of Saturday 22nd September, I excitedly opened the shop door of 24 Mill Street to allow the general public to enter a colourful world of mailed art. It was an enormous space but I managed to fill five large walls of my beautifully bright and spacious Pop-Up Gallery with engaging Mail-Art that inspired visitors to create their own Mail-Art too. The exhibition consisted of work made from or drawn onto envelopes, postcards and mail-able packaging and was embraced by people regardless of age, ability, race, gender and all walks of life who had come together to help realise my vision. I provided envelopes, boxes, pens, stamps and glue to anyone who was inspired to create during their visit, with the completed pieces added to the walls to become a part of an organic ever growing exhibition. 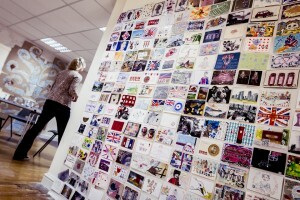 Bedford managed to add whopping 207 amazing pieces of Mail-Art to the exhibition. The exhibition received many visitors over the weekend, some looking to find the entries they themselves had created and posted, displayed proudly on the walls. I was really pleased at how many passers-by were intrigued enough to enter the shop and then stayed to create. Some of the Saturday visitors were so taken with the exhibition that they felt compelled to come again on the Sunday with new ideas to add to the exhibition, with many bringing with them family members or friends to make sculptures from pre-cut postcards and add a picture of their ‘favourite thing’ to a 9ft Tree of Life I had made entirely from stamps. 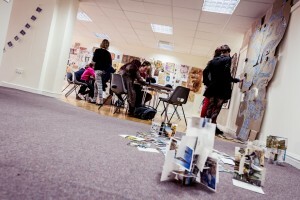 My favourite thing about the whole event was learning the stories behind the pieces of work and how some very unfortunate and troubled people found such enjoyment by being included in the project, which really resonated with me and although it took a lot of time and effort to organise and manage I would gladly do it all again. Giving back the keys to the shop at the end of the exhibition was difficult and a little sad, as it was the end of something so beautiful and so simple. I felt it brought so much enjoyment to people, while at the same time boosting my own confidence, leaving me with a warm feeling inside. Thank you all involved for giving me this opportunity. My budget for the exercise was £250. I came in at £248.84.